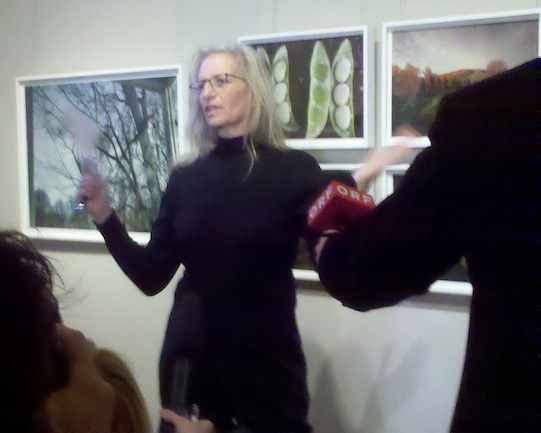 Annie Leibovitz during a media tour of Pilgrimage at SAAM this morning. Because of Annie Leibovitz’s Pilgrimage, I am thinking about portraits of objects. Portraits of absence. Portraits in which the person is the negative space between, around objects. If you were to catalog every single object in my home—the decorative, the practical, the boxed, the fallen behind the bed and the dresser-turned-kitchen island—what skin tone would I be? What size? What height? What faith tradition? What could you know with certainty? Would your narrative be factual or truthful? Is there no way to tell anything other than a lie? Let’s limit the number of objects to five: the tall black file cabinet stuffed with poems (is its sister, stuffed with years of credit card statements the truer story, or another true story? ); the white bed with its white sheets, the stained blanket, the double layer of towels for “that time,” the books, and last month’s journal to remember this year’s promises; the bookshelves (yes, but don’t you need to call out the unread books or the ones purchased out of sentimentality, how do you screen for aspiration, stick to known facts? ), the rugs (and yes, I must insist as they tell a story of line and color, of thrift, of luck, of being childless, of eating too much popcorn and being careless with the coffee grounds). For last, the laptop perhaps, but even that speaks in a borrowed voice, offers only one opinion, tells only what it wants to tell and cannot be coerced into truth. I am remembering as I write this that over the summer I contemplated the poetry of objects. Can objects scaffold a poem the way they can scaffold a still-life painting? Can a list of objects—three clocks set at different times, a row of crystal candlesticks, a mottled ochre vase—tell a complete story on the page the same as if they were bound together with pigment or film? What transubstantiates “list” to “portrait?” Is it an accumulation of lists? Is it a title? With everything thrown out, with a poem reduced mostly to nouns, with no action, can the list exist as a poem? Is it a poem because I am a poet and have written a list? Which leads me to another question someone asked about Pilgrimage: What makes these ordinary photographs art? That Annie Leibovitz shot them? Is any answer completely right?